Lions Valley Athletics Athletes Darryl Rowan, Matthew Reeve, Chad Patterson, Eric Labelle, Sean Patterson, Mike Gill. 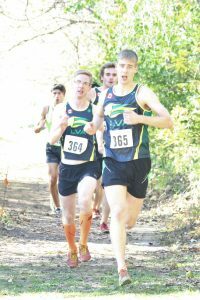 Lions Valley Athletics sent a team of 6 athletes to the 2016 Athletics Ontario Cross Country Championships in Niagara this past weekend. Darryl Rowan, our sole Masters competitor ran the Masters 5KM event, the first race of the day. This was his return to racing after taking some time off due to injury and he was pleased with how he finished. He finished 92nd in 24:18. Our Senior Mens team of Mike Gill, Eric Labelle, Chad Patterson, Sean Patterson, and Matthew Reeve had a terrific day individually and as a team they finished 4th. Mike Gill, coming back from injury that has plagued him throughout the year showed that he still has what it takes to compete with some of the best. 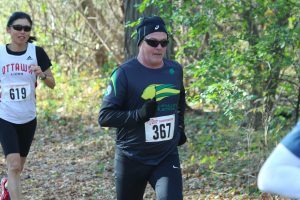 Eric defied expectation with a spectacular return to Cross Country after many years away. These two spent a better part of the race working together and Eric would never be far behind Mike at any point of the 10KM. Mike finished 14th in 34:06 with Eric eleven seconds behind in 16th. Sean, Chad and Matt worked together for almost the entire first 5KM. 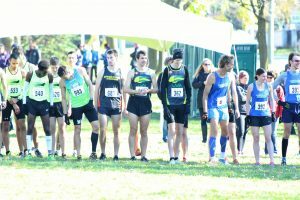 In an attempt to hold onto a small group that had formed, Sean and Chad pushed to not lose any ground and eventually finished 25th and 28th respectively. Matt ran a hard race and spent quite a bit alone but he still kept running through the finish earning him a 10KM personal best time in 37:48. Everyone who competed ran well and it was an improvement over last year. We hope to improve next year with more competitors and more excellent races. 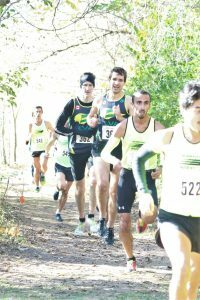 It was a big weekend for Cross Country and here are some of the other Championship results from U-Sport, and CCAA.